ModSecurity is an open source, cross-platform web application firewall (WAF) module. Known as the "Swiss Army Knife" of WAFs, it enables web application defenders to gain visibility into HTTP(S) traffic and provides a power rules language and API to implement advanced protections. ModSecurity Handbook: Introduction (Sample) is a free sample that consists of the first chapter (Introduction) of ModSecurity Handbook. ModSecurity is a toolkit for real-time web application monitoring, logging, and access control. I like to think about it as an enabler: there are no hard rules telling you what to do; instead, it is up to you to choose your own path through the available features. That's why the title of this section asks what ModSecurity can do, not what it does. The freedom to choose what to do is an essential part of ModSecurity's identity and goes very well with its open source nature. With full access to the source code, your freedom to choose extends to the ability to customize and extend the tool itself to make it fit your needs. It's not a matter of ideology, but of practicality. I simply don't want my tools to restrict what I can do. At its core, ModSecurity gives you access to the HTTP traffic stream, in real-time, along with the ability to inspect it. This is enough for real-time security monitoring. There's an added dimension of what's possible through ModSecurity's persistent storage mechanism, which enables you to track system elements over time and perform event correlation. You are able to reliably block, if you so wish, because ModSecurity uses full request and response buffering. Security assessment is largely seen as an active scheduled event, in which an independent team is sourced to try to perform a simulated attack. Continuous passive security assessment is a variation of real-time monitoring, where, instead of focusing on the behavior of the external parties, you focus on the behavior of the system itself. It's an early warning system of sorts that can detect traces of many abnormalities and security weaknesses before they are exploited. I think that it's fair to say that I built ModSecurity for myself: a security expert who needs to intercept, analyze, and store HTTP traffic. I didn't see much value in hardcoded functionality, because real life is so complex that everyone needs to do things just slightly differently. ModSecurity achieves flexibility by giving you a powerful rule language, which allows you to do exactly what you need to, in combination with the ability to apply rules only where you need to. ModSecurity will take great care to never interact with a transaction unless you tell it to. That is simply because I don't trust tools, even the one I built, to make decisions for me. That's why ModSecurity will give you plenty of information, but ultimately leave the decisions to you. There's no such thing as a perfect tool, but a predictable one is the next best thing. 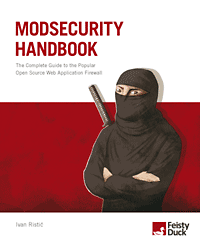 Armed with all the facts, you can understand ModSecurity's weak points and work around them. Over the course of six years spent working on ModSecurity, we came up with many ideas for what ModSecurity could do. We didn't act on most of them. We kept them for later. Why? Because we understood that we have limited resources available at our disposal and that our minds (ideas) are far faster than our implementation abilities. We chose to limit the available functionality, but do really well at what we decided to keep in. There are bits in ModSecurity that fall outside the scope of these four principles. For example, ModSecurity can change the way Apache identifies itself to the outside world, confine the Apache process within a jail, and even implement an elaborate scheme to deal with a onceinfamous universal XSS vulnerability in Adobe Reader. Although it was I who added those features, I now think that they detract from the main purpose of ModSecurity, which is a reliable and predictable tool that allows for HTTP traffic inspection. Because ModSecurity is an Apache module, you can add it to any compatible version of Apache. At the moment that means a reasonably recent Apache version from the 2.0.x branch, although a newer 2.2.x version is recommended. The embedded option is a great choice for those who already have their architecture laid out and don't want to change it. Embedded deployment is also the only option if you need to protect hundreds of web servers. In such situations, it is impractical to build a separate proxybased security layer. Embedded ModSecurity not only does not introduce new points of failure, but it scales seamlessly as the underlying web infrastructure scales. The main challenge with embedded deployment is that server resources are shared between the web server and ModSecurity. Reverse proxies are effectively HTTP routers, designed to stand between web servers and their clients. When you install a dedicated Apache reverse proxy and add ModSecurity to it, you get a â€œproperâ€� network web application firewall, which you can use to protect any number of web servers on the same network. Many security practitioners prefer having a separate security layer. With it you get complete isolation from the systems you are protecting. On the performance front, a standalone ModSecurity will have resources dedicated to it, which means that you will be able to do more (i.e., have more complex rules). The main disadvantage of this approach is the new point of failure, which will need to be addressed with a high-availability setup of two or more reverse proxies. Defending web applications is difficult, because there are so many of them, and they are all different. (I often say that every web application effectively creates its own communication protocol.) It would be very handy to have ModSecurity observe application traffic and create a model that could later be used to generate policy or assist with false positives. While I was at Breach Security, I started a project called ModProfiler [http://www.modsecurity.org/projects/modprofiler/] as a step toward learning, but that project is still as I left it, as version 0.2. ModSecurity can be embedded only in Apache 2.x, but when you deploy it as a reverse proxy, it can be used to protect any web server. Reverse proxies are not everyone's cup of tea, however, and sometimes it would be very handy to deploy ModSecurity passively, without having to change anything on the network. Copyright © 2004-2019 Trustwave. All rights reserved. ModSecurity and mod_security are trademarks or registered trademarks of Trustwave Holdings, Inc.